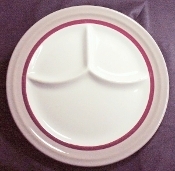 Vintage From Paul is pleased to offer this Sterling China Restaurant Grille Plate. The Sterling China Restaurant Grille Plate has a white body decorated at the rim with a widde taupe banding and rust inner verge. The Sterling China Restaurant Grille Plate measure a generous 9-3/8 inches in diameter. After 85 years, the Sterling China Company is still turning out quality dinnerware for use in the food service industry. Since its beginning in 1917, Sterling China has made millions of pieces of dinnerware for use by hotels, restaurants, airlines, railroads, steamship lines, and hospitals. The company's history reaches back past its 1917 founding. Like so many other makers of American dinnerware, Sterling China has a history checkered with changing owners, acquisitions, and name changes. Sterling China was founded in Wellsville, Ohio, and maintained offices for many years in East Liverpool, Ohio, but its business endeavors reached far and wide.